The federal VA has provided the following information on its Burn Pit webpage, including linked from the Gulf War webpage (www.va.gov/GulfWar). 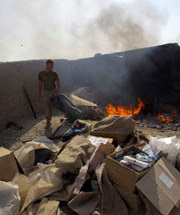 Open air burn pits have been used extensively in the current conflicts in Iraq and Afghanistan to dispose of waste. Many returning Veterans have expressed health concerns related to their exposure to smoke from burning trash and human waste. The smoke from burning waste may release a variety of toxins into the air, which may blow into living and working areas. 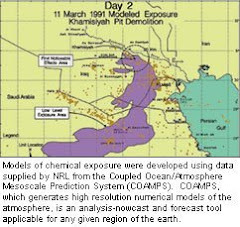 Exposure to specific individual toxins may affect the skin, respiratory system, eyes, liver, kidneys, central nervous system, cardiovascular system, reproductive system, peripheral nervous system, and gastrointestinal tract. 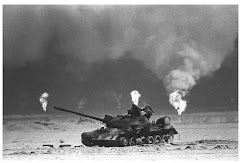 In November 2009, at the request of VA, the National Academy of Sciences Institute of Medicine (IOM) began an 18-month study to determine the long-term health effects of exposure to burn pits in Iraq and Afghanistan. The report for the study should be completed and available by summer 2011.